Yesterday the Memoria Viva Society of Edmonton joined approximately 130 Latin Americans, many of them from Mexico, to show solidarity for the missing 43 students of Ayotzinapa, Guerrero, Mexico and the many others that have been made to disappear for expressing their hopes and desires for a better world for all. Yesterday was also the 16th International Transgender Day of Remembrance, it has been the 10th year that this day has been observed in Edmonton. Yesterday it was reported that more than 223 important and valuable lives were lost to hate, intolerance and indifference throughout the world in 2014 to date. This is not a subject that we often talk about in the Latin American community, but the time for silence is over. We are living in a time when even Pope Francis has declared that the Lesbian, Gay, Bisexual, Transgender and Queer (LGBTQ) community must be respected. What of the progressives within our community? Where do we stand on this issue? Why have we not said more to defend the dignity and life of our trans family, friends, and community members? The time has come for us to speak up! It’s time to come together and remember transgender people we have lost and to find strength and courage as together we work towards change, acceptance and inclusion for all. This year the majority of transgender people who were murdered were from Latin America, ironically its this region where most work is being done to create awareness about this issue. What does this say about tolerance in Latin America? It is also important to share that the number of those lost to hate and intolerance is under-reported. We need to do more here in Edmonton and also to share with our family and friends in Latin America that gender is broader than the role of a man or a woman that has been traditionally communicated to us through conservative institutions. We must reach out and continue to build a better world with all members of the LGBTQ community. To find out more about this issue we recommend visiting “Transrespect versus Transphobia Worldwide” project, where you can find more data, including tables, name lists, and maps. 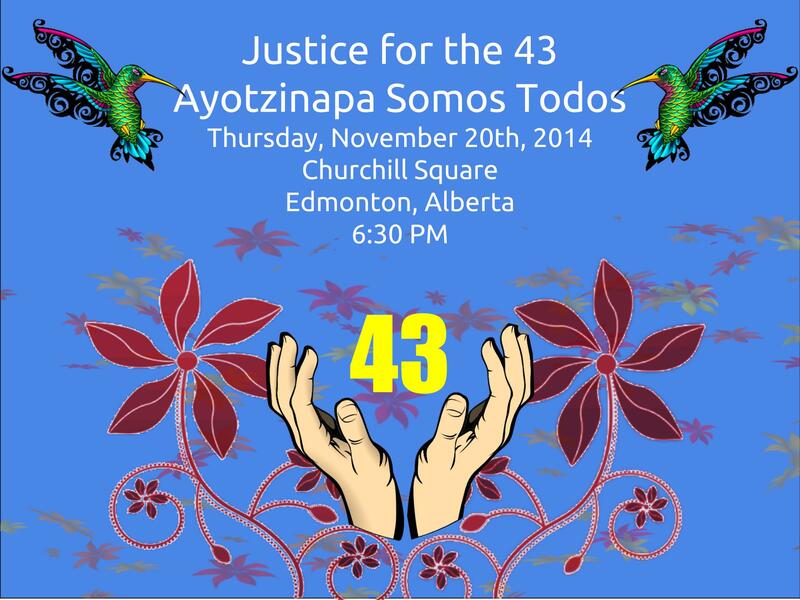 Please join the Memoria Viva Society of Edmonton and Mexicanos en Edmonton and other Latin Americans and Canadians asking for justice for the 43 missing students of Ayotzinapa, Guerrero, Mexico. We call on the Prime Minister of Canada, Stephen Harper, and Minister of Foreign Affairs, John Baird to demand that Mexican President, Enrique Peña Nieto, ensure that human rights abuses in Mexico, in relation to the case of the 43 students of Ayotzinapa, be investigated to the full extent of the law and that those culpable of human rights abuses be prosecuted. On November 5 2014, people from all over the world came together to support the cause of the 43 missing students of the Rural Isidro Burgos School in Ayotzinapa, Guerrero, Mexico. Rejecting conformity and resignation when it comes to the criminally repressive government of Mexico and the silence of media, the Memoria Viva Society of Edmonton (MVSE), representing Latin Americans in diaspora, calls for solidarity with the people of Mexico. 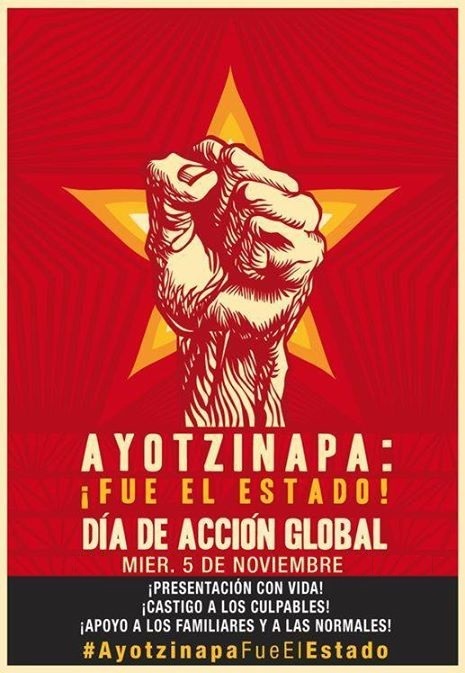 Today we raise our voices of hope and in peaceful resistance state that “We are all Ayotzinapa”. Join us on November 20th in Churchill Square to stand in solidarity with the 43 missing students of Ayotzinapa, on this historic date commemorating the fallen of the Mexican Revolution (November 20th 1910). On November 5 2014, people from all over the world are coming together to support the cause of the 43 missing students of the Rural Isidro Burgos School in Ayotzinapa, Guerrero, Mexico. Rejecting conformity and resignation when it comes to the criminally repressive government of Mexico and the silence of media, the Memoria Viva Society of Edmonton (MVSE), representing Latin Americans in diaspora, calls for solidarity with the people of Mexico. Today is the global day of action in Mexico to demand the return of the 43 students kidnapped in the state of Guerrero. Today we raise our voices of hope and in peaceful resistance state that “We are all Ayotzinapa”. This past September 26, 2014, after four students were assassinated by the police -one with his eyes gouged and face flensed with a box cutter- in Iguala Guerrero Mexico, 43 more were bundled into police cars and were made to disappear. The immediate reaction of indignation spread through the state of Guerrero and rapidly spread throughout all of Mexico and now around the world. The connection between state officials and drug traffickers that eliminate all opposition, which simply choose to stand up for basic human rights. In relation to these occurrences, MVSE wishes to highlight the abuse and disinformation by top media companies in Mexico in downplaying the kidnapping of the 43 students, both within Mexico and to the international community. MVSE declares a strong call of solidarity with the families of the 43 missing students, and along with them, call on the Mexican government to implement an exhaustive investigation into the kidnapping of the 43 students and the connection between Mexican government state officials and the drug cartels and to put an end to the impunity and extreme violence that is killing average everyday Mexican citizens.